If you haven’t gleaned from reading my blog, I am very Catholic. I say that with a wince because even though I’m proud to be Catholic, I am not one of those religious fanatics who follows the letter of the law. People think that when you say, I’m very this or that, that you adhere to a certain set of rules. I’m not like that. Against the backdrop of the Catholic faith, I follow my own set of principles and values that work for me. As an example, I am pro-choice. Who am I to tell someone else what they can and cannot do? My son’s name Francisco came about for a variety of reasons. The name is common in both Italy and the Philippines which is Dean’s heritage and my heritage, respectively. Also, the kid was born in the city of San Francisco. The patron saint of San Francisco is St. Francis and the pope chose to honor St. Francis and his mission to serve the poor by taking on that name. For all of those reasons, Franco is so named, but mainly he is named after Pope Francis. 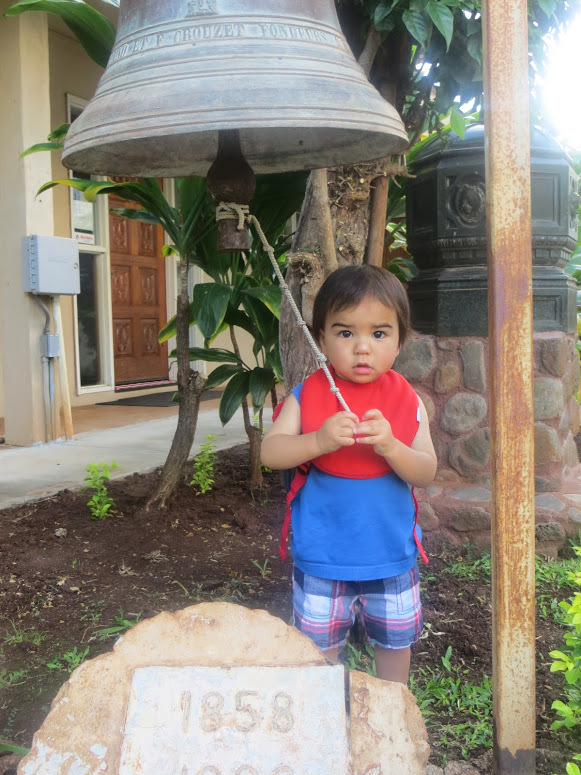 Here is a recent shot of my 16 month old baby ringing the bell in front of Maria Lanakila Catholic church in Lahaina, Maui. I couldn’t be more thrilled that the holy and humble Pope Francis has ascended to lead the Catholic church. Even from the beginning, he eschewed the upgrades in clothing, transportation and lodging provided to the pope. He opted to live in a guest house outside the papal palace. This is unprecedented, but so welcome by his followers. Finally! Someone who is following in the footsteps of Jesus. Makes sense, right? And his actions and message of openness and humility are obviously resonating with legions of people. Here is the leader of a major religion who cares about all of humanity, not just his own religious congregation. “In a world where different forms of modern tyranny seek to suppress religious freedom, or as I mentioned before, try to reduce it to a subculture without right to a voice in the public square, or to use religion as a pretext for hatred and brutality, it is imperative that the followers of the various religions join their voices calling for peace, tolerance, respect for the dignity and rights of others.” I love the picture above of Pope Francis with other religious leaders. This is the way it should be. Everyone praying for each other. Another thing I love about this man is how he asks for our prayers. Most priests and religious leaders bless the people, but Pope Francis constantly asks for our prayers in return. To me, he is saying, I am a sinful man. I am not without fault. I need your prayers too. Many blessings and prayers for this amazing leader who is spreading messages of love around the world. PS. I have to throw out there that I saw Pope John Paul II in his popemobile in the Philippines in 1995. The crowds were shockingly large since the Philippines is a very Catholic country. Nevertheless, as short as I am, I got to see him! I am hoping we will get to see Pope Francis one day. I most definitely hope you get to see Pope Francis one day and as a fellow Catholic, too I most definitely agree that he is “The People’s Pope”. I know a few people who made the 90 minute trip to Philadelphia yesterday to see Pope Francis. We were hoping to get a glimpse of him at Vatican City, but no such luck! As a non-Catholic, I appreciate the Pope’s message of tolerance and respect. If only all world leaders would heed his advice. Pope Francis has made me believe in the Catholic Church again. For years I have been a “Buddhist Catholic” as I have infused some Buddhism into my Catholic beliefs. I feel that Pope Francis is a true servant of the church and is the right man for this time. I’m not Catholic but I love him so much. I was in NJ this weekend, near PA, and there were signs saying that the traffic to Philly was crazy because of the Pope’s visit. Very cool. I also love the origin of your son’s name! I am not catholic, but from what I keep hearing this pope is very special and distinguished from those before. I also have to add that your kiddo is getting so big! You don’t splash him all over the blog so it just snuck up on me!! Wow.